I was first introduced to the work of Mairead O’hEocha a little over a year ago, being late to considerably large and entirely justified bandwagon. What initially drew my attention was the completely personal and selfish connection I felt to her series Home Rules. These paintings depicted scenes and locations O’hEocha had encountered during her daily commute from Dublin to Gorey, where she taught in Gorey School of Art. Sure I had seen depictions of the rural town and surrounding countryside of my youth before but not anything like this. Her style and eye evolved further in 2011’s via An Lár and 2012’s The Sky was Yellow and the Sun was Blue, which left both the confines of North Wexford and the natural palette presented by her subject matter. O’hEocha has now returned with a new series entitled Blackbirds in the Garden of Prisms, a series of still lifes of flowers that contain neither blackbirds nor prisms. The idea of a series of still life paintings of flowers is intriguing. O’hEocha is a contemporary painter pushing on the boundaries of spatial form in her practice – reflected by her recent inclusion in the 3rd edition of Phaidon’s acclaimed ‘Vitamin P’ series. Still lifes, and particularly those preoccupied with floral arrangements, have a deep rooted history in the annals of painting; however, recently they are seen as predominantly a confine for amateur painters to test and challenge their practice. O’hEocha takes inspiration from both these departure points with each of the paintings, seven are presented here, nodding towards past movements and pulling from past masters. The work also displays the genealogy of the word amateur (from the French for “lover of”) executed in full form as each piece speaks of an artist engaged with her practice and impassioned with the direction she takes it and it takes her. The two protagonists of the shows title, Blackbirds and Garden Prims, nod towards the modernist American poet Wallace Stevens, via his haiku inspired Thirteen Ways of Looking at a Blackbird, and Swiss expressionist painter Johannes Itten, via his theories into the affect and power of ‘subjective’ and ‘objective’ colours. While absent in direct physical form, hints of blackbirds exist in suggestions of colours as well as the turns and twists of the brush head. Make no mistake, this is an embolden approach and one that sees the oeuvre function on a dual level. A viewer can get lost in the brushstrokes of an individual piece but still be drawn to the homogeneity of the entire series. Some of the paintings wear their influences on their sleeves as titles reference Vallayer-Coster, a favourite of Marie Antoinette, and Georgian painter Philip Reinagle. Others display elements of Flemish Baroque, while one is playful named after a fictional dinosaur called an Omnivorousaur. An exhibition established in but not clouded by theory, and one with an acute ability not to take itself too seriously. One concept, movement, ideology rings out subtly but loudly in Blackbirds in the Garden of Prisms and that is Romanticism. 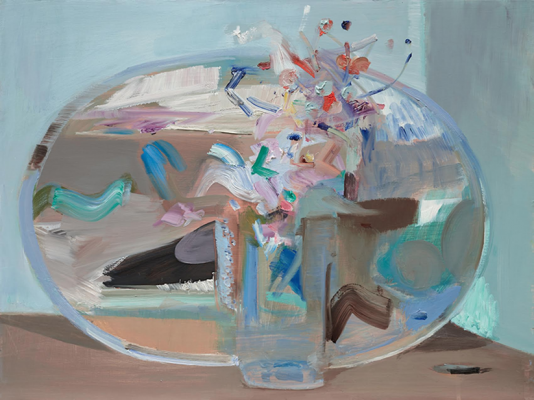 At its heart Romanticism was a break from the social conventions of the time, something O’hEocha mirrors by tackling modern contemporary painting by using something unexpected – seemingly traditional still lifes. The spirituality of Romanticism exists here, along with the same sense of mystery and emotion generated by the likes of Shelley, Keats and Friedrich. 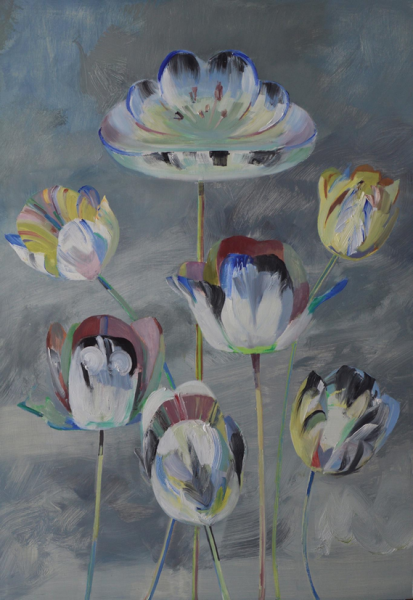 It was often preoccupied by death and rebirth – a vase of flowers is one that is, in essence, dying and encapsulated eternally in paint by O’hEocha. Romanticism was a movement born out of a reaction to the Industrial Revolution, a shift that echoes the transition O’hEocha has undergone as she has exited the predominantly urban views and aesthetics of her past shows. The result is an exhibition that intrigues the senses and opens a three-way dialogue between audience, artist and work. Be it a back street in a Celtic tiger town or a rose in a glass tumbler vase O’hEocha is an artist that can grab the imagination with seemingly ordinary objects in the most extraordinary way. Blackbirds in the Garden of Prisms continues in Mother’ Tankstation (41-43 Watling Street, Dublin 8) until October 29th, full details here. Originally published on The Thin Air, online here.